The Topic pack comes with a Topic Booklet, Write Your Own Notes booklet and a Board Game. They were created by a mom who wanted to find a way to help her dyslexic daughter so the topic booklets are key points, no long paragraphs, no flowery descriptive words. 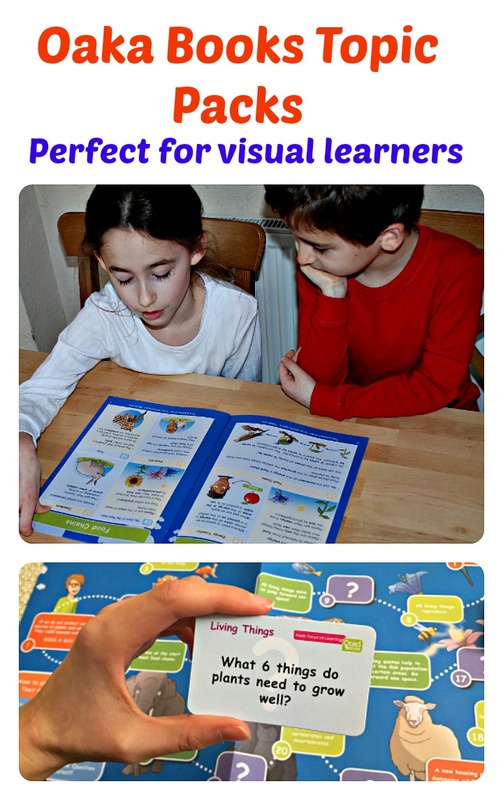 The pages are set out in a style that suits visual learners – not too much crowded onto a page, colourful pictures without being overpowering. My daughter is Not dyslexic but she is very much a visual learner and struggles with pages that are too crowded. We tried this pack first because it is an area she enjoys, she already knows a lot about animals, food chains and habitats so I knew it would be a good way to introduce the topic pack idea to her. She LOVED it and she wants MORE of them. She sat and read the Topic booklets with her younger brother (he also really liked the way the topic booklets were set out). If he was in school he would have been in year 2 and he could almost manage the topic booklet by himself, just battled with a few of the longer words. Then she had a go at writing some of the notes herself – she did not start at the beginning but choose the section on food chains and tested herself to see if she could complete it without looking back at the notes (and she did). All three of us played the game together. This game is brilliant. Simple but such a great way to revise the facts that the kids have learnt. The Board has blocks on it, some with question marks on, some with facts – if you land on the question marks you need to pick up a question card and answer it. Normal board game idea, you throw the dice and try to get to the finish block first. Straight forward. But really such a great idea I wish we had learnt our science like this when I was younger. Really LOVED this. I did think a bit about how this game might work if you played it with siblings or a mixed age group where some where not be as knowledgable in this area. You could remove some of the question cards but then it would mean the older kids would not benefit from the harder questions so I came up with the idea of 2 separate groups of cards (one group having the “tougher questions ” in it). That way an older sibling can still revise / test themselves on everything they have learnt and a younger sibling or friend could happily join in. And the great thing is even after you have finished the topic pack and move on to another set you can always dig the game out as a way to remind the kids of what they learnt – my plan is as we go through the topic packs – yes I am planning on doing more – I am going to collect the games and then every so often we will dig one out and play it as a fun way of revising our science and history. And after playing the game she went back to the notes and completed some more, sometimes on her own and sometimes checking back in the topic booklet. The one thing about the Write Your Own Notes Booklet is the spaces provided for the words and phrases are not big. My youngest would not be able to write in the space provided. Okay so Oaka Books sent us two topic packs – this one – Living Things and Their Habitats and The Stone Age (both topic packs sell for £7.97). So you are probably thinking well sure they liked it they were given them for free. hmm. No. Firstly I LOVED them I think they are brilliant. The way the Topic booklets have been set out – key points with pictures, no long paragraphs, it totally suits my daughter. The Write Your Own Notes – Loved it and the Game that was included so simple but genius – a brilliant way of helping the kids remember the facts. In fact last night when my hubbie got home from work I dragged him to my computer and showed him the topic packs and the digital library (yes there is more than just these topic packs they also have an online library) and my words were ” look this is what we are going to use when we get to KS3″ – because if I am totally honest in the back of my mind even though it is still 18 months away I have already been thinking about what KS3 resources we will use with my daughter. The Digital section has lots of KS3 resources in it. I will write a separate detailed review about the digital side of Oaka Books soon. This entry was posted in Home education resources and tagged home ed, home education, homeschooling, ks2, Living Things and Their Habitats, Oaka Books, science. Bookmark the permalink. This just looks soooo interesting and the board game is an interesting addition to the learning process….well done children it looks as though you could teach a class yourselves on this subject.